If wealth were measured in biodiversity, the forests of the Congo Basin would be rich indeed. Wildlife from the endangered bonobo to the Congo peacock can be found in this ecosystem, not to mention more than 600 species of trees (and that’s just the tree species that are known). Unfortunately, within AWF’s Congo landscape in northern Democratic Republic of Congo (DRC), the people living in and relying on the forests are among the poorest in the country. To survive, they have resorted to bushmeat hunting, cutting down trees to make charcoal and burning parts of the forest to clear agricultural plots—activities that have threatened the Basin’s wildlife and led to its deforestation. Increased the productivity of local farmers’ crops in agricultural zones and expanded down-stream market access for products produced in these agricultural zones. AWF recently began another round of projects in the landscape in collaboration with USAID and communities. From a bird’s-eye view, what we’re now working toward can modestly be summed up as mapping an area, training personnel and negotiating alternative land uses. Up close, however, these are much-needed conservation efforts that will help establish more community reserves to create a contiguous protected corridor rather than just islands of protected areas; reduce bushmeat hunting by sensitizing hunters, market sellers and customers about the risks of consuming bushmeat and its effects on wildlife; and transform the Lomako research center into a facility of excellence dedicated to training for anti-poaching and ecological monitoring. 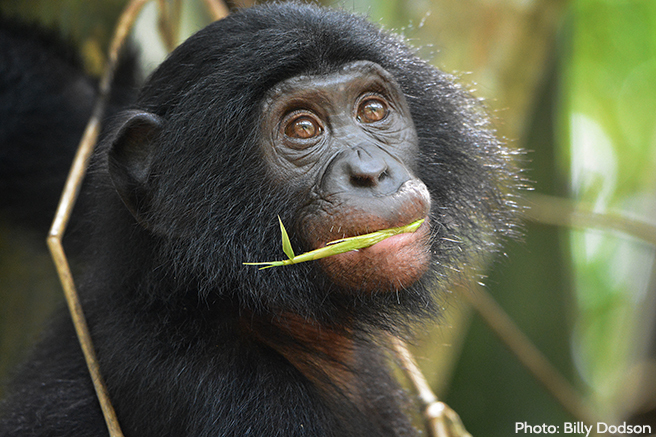 Given AWF’s strong partnerships in the landscape, we’re banking on success. Mayu is director of content and messaging for AWF, responsible for AWF's print and online content, collateral and overall organizational messaging. At home, she divides her time between being a tyrant to her family and napping on the living room couch. A graduate of the University of Illinois at Urbana-Champaign, Mayu has nearly 20 years' experience in communications, storytelling and writing.